The fully self-contained Phoenix Mini Max has enough holding tank capacity for an extended weekend of off-grid camping. The 15-gallons of fresh capacity is augmented by a 6-gallon water heater bringing the total fresh water capacity to 21-gallons. That’s an impressive amount of fresh water for a camper this size. The limiting factor is the 7-gallon grey tank. Mini Max owners can get around this by draining the grey tank into a portable container. This is how pop-up campers without grey tanks collect grey water. Collected grey water can then be disposed of in a campground toilet, just like a cassette. If you dump the 7-gallon grey tank twice, you can use all 21-gallons of fresh water on tap (7, 7, and 7). If you conserve water (navy showers every other day, etc. ), 21-gallons could last two adults through three to four days. That’s amazing for a compact short bed pop-up. Another possibly limiting factor is the cassette toilet capacity. We have camped with cassette toilet systems on a number of occasions; some extended, and other short term. What we learned is that a 5-gallon cassette will last an adult individual about four to six days of exclusive use. Cut that in half for adult couples; two to three days. Then you will need to find a residential toilet to dump the cassette. If there’s a toilet nearby, you can dump the cassette and captured grey water. That would be ideal. The sheer convenience of being able to dump a cassette in any residential toilet cannot be overstated. Many cassette toilet owners go camping for weekends and simply dump their cassette when they get home. Others use campground toilets, porta johns, and even standard dump stations. The versatility of a cassette toilet system is unmatched. On the flip side, dumping a cassette full of human waste can be both strenuous and a bit to “up close with gross” for some folks. In practice, it’s actually a very fast and painless experience, but the weight and concept of a cassette is something to consider before committing to a purchase. 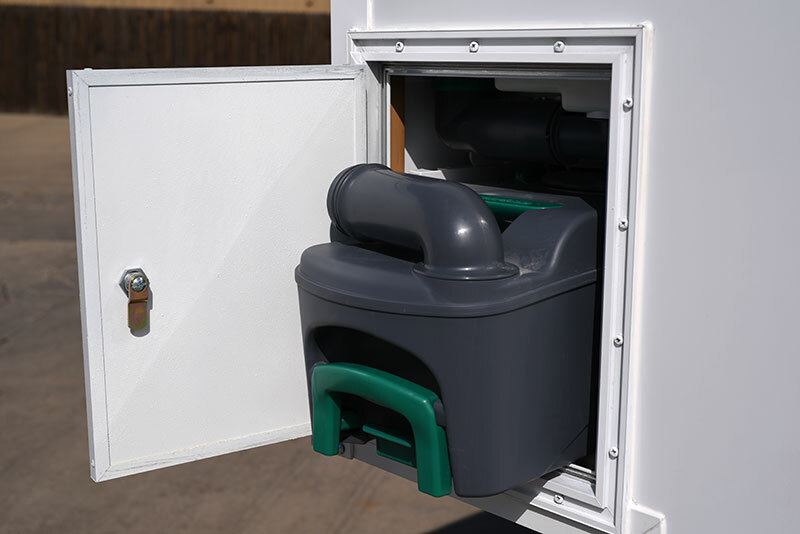 Our standard cassette toilet advice is to go to a dealer with a cassette toilet camper, have them fill it with fresh water, and then experience pulling the full cassette out and dumping it in a residential toilet for yourself. After that you will have an excellent idea of what cassette toilet ownership is like, and whether it’s for you. The 6-gallon water heater may actually be overkill. 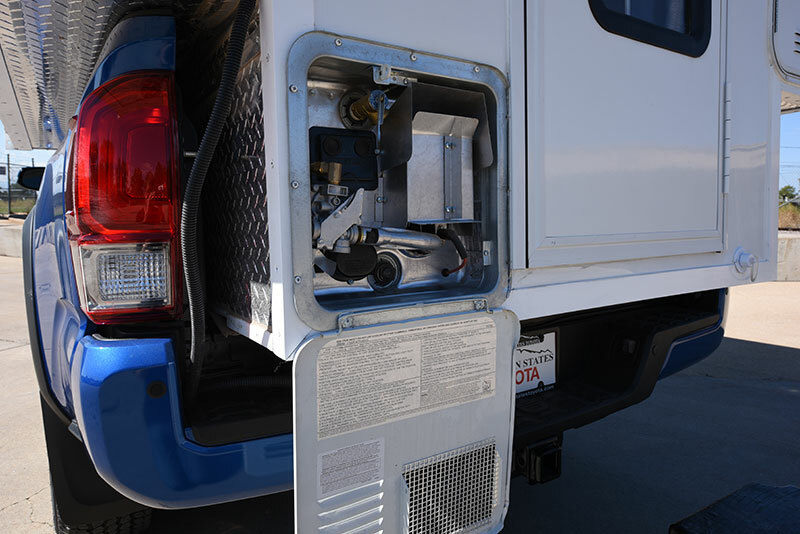 Other manufacturers who target mid-size and short bed half-tons have moved to 4-gallon water heaters, a move that seems to have very little downside while reducing weight. That said, it’s nice to have two additional gallons of water on board. The Mini Max has one 20-pound vertical propane tank and one Group-24 AGM battery standard. 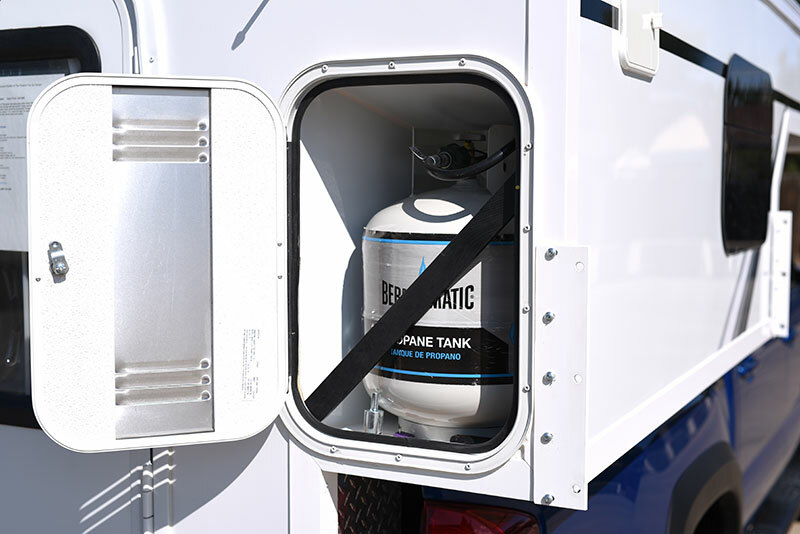 This is plenty of propane and battery capacity for a camper this size, but owners will need to get in tune with their propane and battery use. Welcome to the Zen of truck camper holding tank and battery systems.